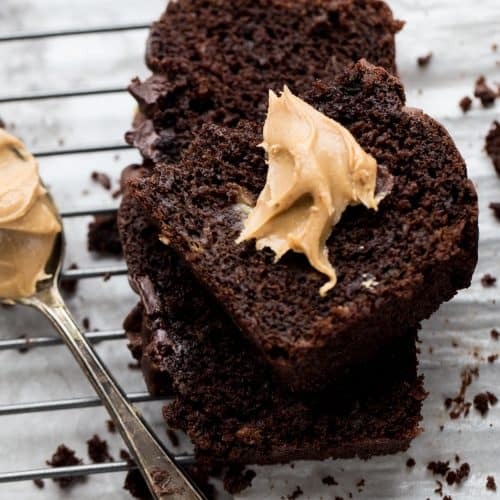 Moist Peanut Butter Chocolate Banana Bread recipe. 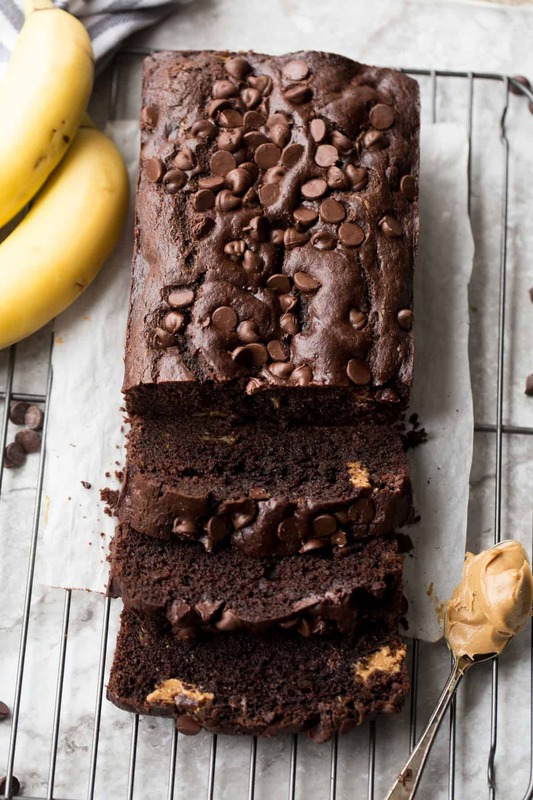 Rich chocolate banana bread loaf loaded with bananas, peanut butter and chocolate chip morsels. Every bite is heavenly. If you like banana bread, try our Banana Nut Bread Recipe or Zucchini Banana Bread. 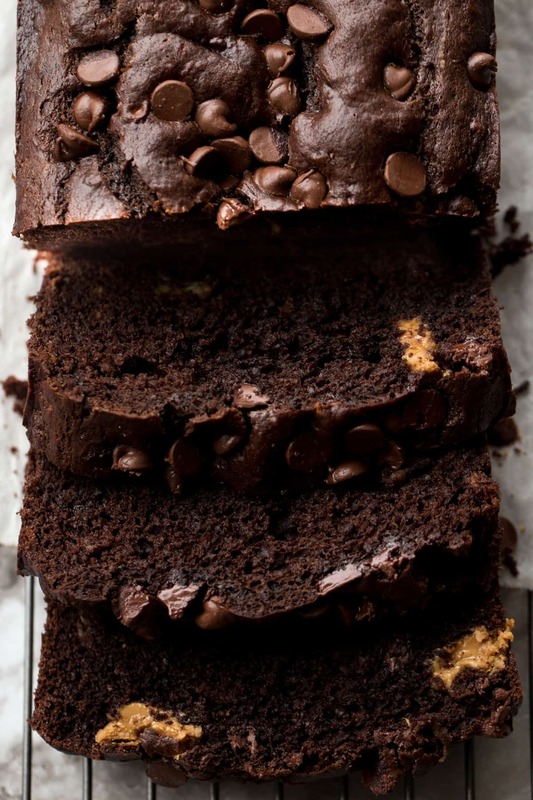 This recipe is a chocolate lovers dream! 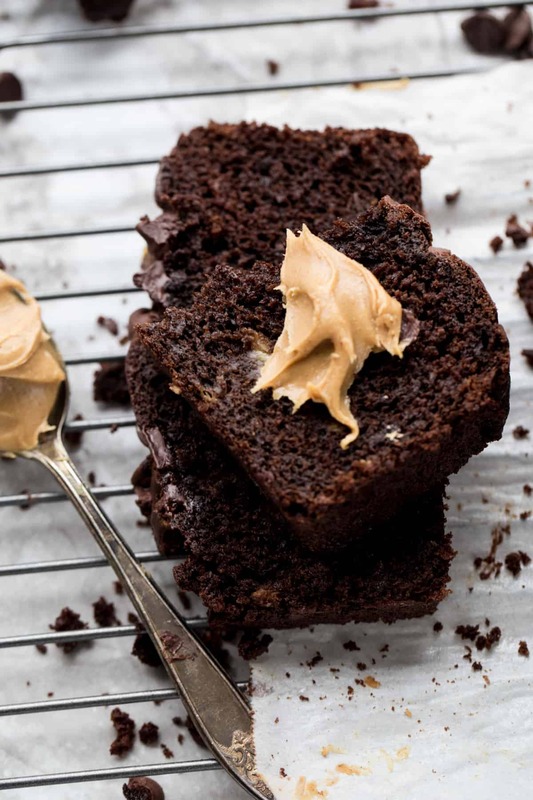 Rich double chocolate bread loaf filled with a hint of peanut butter in the bread and added peanut butter. The banana flavor isn’t overpowering but combined with chocolate and peanut butter, it truly is divine. This bread loaf is a great way to use up overripe bananas. In a bowl, combine the dry ingredients, the flour, baking powder and soda with cocoa. Set aside. In a separate bowl, mash bananas. Add the sour cream, oil, vanilla and peanut butter and combine. In a large bowl, cream together the butter and sugar. Add in one egg at a time. Add the banana mixture and mix to combine. Add half of the flour mixture, gently mix. Add remaining flour and mix. Fold in the chocolate chip morsels, reserving a few tablespoons. Pour 2/3 of the batter into bread pan. Add drops of peanut butter over the batter. Gently pour remaining batter over the peanut butter. Add reserved chocolate chip morsels over batter. NOTE: Allow bread loaf to cool a bit in the bread pan before transferring to a cooling rack. Yes! Banana bread freezes well. When freezing, allow the banana bread to completely cool before freezing the loaf. The bread will stay fresh for up to 2 months. Thaw banana bread at room temperature before serving. Reheat bread until warm if warm bread is desired. TOOLS used to prepare Chocolate Banana Bread: bread pan and whisk. I hope you give this Peanut Butter Banana Bread recipe a try! Don’t forget to leave us your feedback in the comments below. Prepare 9”x5” bread pan. Cover with parchment paper and lightly coat with baking spray, dust with flour. Set aside. 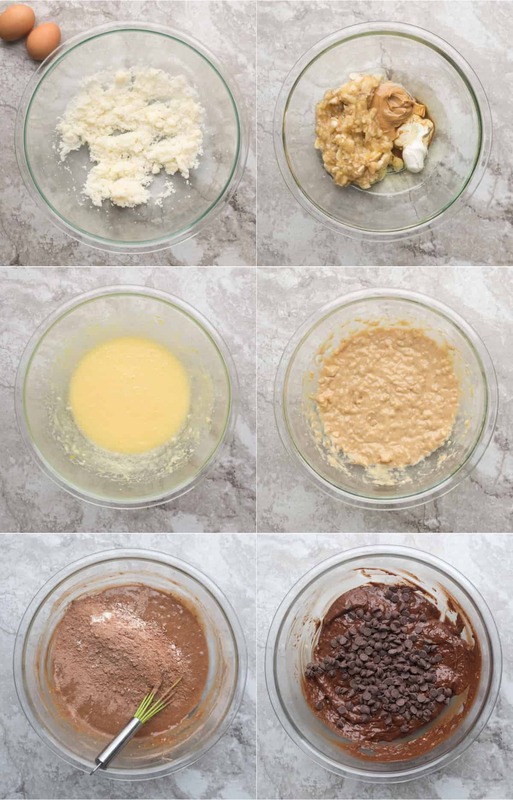 Combine together flour, baking powder, baking soda, and cocoa powder. Set aside. In a separate bowl, mash the bananas. Add the sour cream, oil, vanilla and peanut butter. In a large bowl, cream together butter and sugar. Add in one egg at a time. Add the banana mixture and combine. Add in half the flour mixture and whisk together. Add the rest of the flour, mix. Bake 45-55 minutes, or until toothpick comes out clean if inserted into the center of the loaf. (Bake time may slightly vary depending on your oven). Allow loaf to cool a bit. With a sharp knife, run around the edges of the loaf to release sides. Kids loved it! So delicious thank you so much!!! I love recipes that kids approve of, Alla. I’m so glad they enjoyed the banana bread. 🙂 Thanks for visiting. I can’t eat sour cream is there something else I can use in place of that? I’ve not experimented without sour cream so cannot be for sure but perhaps plain yogurt would work? I LOVE THIS RECIPE. Every time I make it, it turns out so moist and soft. It is filled with all these different ingredients that come together to form the perfect bread. I make this like every other day! So good! I’m right there with you. This sweet bread loaf is so addictive. This is a great bread recipe even if you don’t like peanut butter. Stop by and visit our online home again!